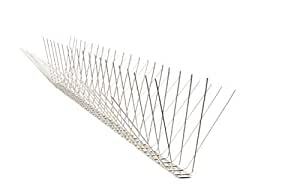 VEXO Stainless Steel Bird Spikes deter birds from landing on protected surfaces preventing them perching, roosting or even nesting on various types of structures. VEXO spikes are ideal to protect roof ledges or parapets, window sills, awnings, signs, statues, trusses and beams. SS41 is a wide configuration of spikes, providing protective coverage of 155mm. Made from 100% high-grade #304 stainless steel that protects against rust, UV and chemical degradation, VEXO Bird Spikes will protect buildings and structures from bird excrement for more than 15 years. These spikes visually deter birds from coming near the surface but are almost invisible to the human eye. The spike tips are blunted to prevent any harm to either people or birds. V-shaped bird spikes are spot welded with precision to create a stronger and cleaner fusion and ensure long life. The stainless steel base is light and conformable to any surface.